1Department of Chemical Engineering, Farahan Branch, Islamic Azad University, Farahan, Iran. 2Young researchers and Elite Club, Farahan Branch, Islamic Azad University, Farahan, Iran. This research reported a study on COD removal from petrochemical wastewater (ml/l) by the electro-Fenton process via the effects of different parameters such as reaction time, current density, pH, H2O2/Fe2+ molar ratio, and volume fraction of H2O2. For this purpose, first, the Nanopores on the aluminum ‌electrode surface were prepared as the AAO films were fabricated using the two-step anodization of 6063 aluminum alloy sheets at ambient temperature in sulfuric acid and phosphoric acid electrolyte solutions respectively.The nanostructures created on electrode confirmed by Scanning Electron Microscopy (SEM). Then, Efficiency of electrochemical oxidation process was tested by COD determination via electrolyte cell contain waste water, Fe2+, H2O2 and AAO electrode based on experimental design. The optimum COD removal (65.03%) was obtained at pH of 2.96, the reaction time of 89.51 min, the current density of 69.57 mA, the H2O2/Fe2+ molar ratio of 3.42 and volume fraction of H2O2 to petrochemical wastewater of 1.93 (ml/l). Petrochemical plants, including polluting industries environment through emissions of carbon monoxide, hydrogen and synthesis gas etc. The petrochemical industry, including oil refining, petrochemical processing, and natural gas production, generates large amounts of wastewater . Such wastewater is usually characterized by significant concentrations of suspended solids, chemical oxygen demand (COD), oil and grease, sulfide, ammonia, phenols, hydrocarbons, benzene, toluene, ethylbenzene, xylene and polycyclic aromatic hydrocarbons (PAHs) [2,3].Large quantities of wastewater are generated from petrochemical industries. The discharge of petrochemical wastewater (PCW) could cause serious environmental pollution and human health concerns .The treatment method used for petrochemical wastewater is generally contained pretreatment for improving the biodegradation and reduction of toxicity, via different methods of biological treatment such as activated sludge process, anoxic–oxic (A/O) process, fluidized bed reactor, membrane bioreactor and biofilm process [5,6,7]. Ultrasonic, flocculation, Fenton and ozone oxidation, as well as anaerobic hydrolysis–acidification, are methods that used for pretreatment processes . Hydroxyl radicals, with a standard potential of 2.8 V and a half lifetime of about 9-10 seconds, enable fast and non-selective oxidation of a wide range of molecules of environmental concern. Usually cathode material for electro-Fenton processes evaluated base on reducing ability oxygen to hydrogen peroxide and ferric ions reducing to ferrous ions and in next step, promoting the reaction leading to OHradical production. Electro-generation of hydrogen peroxide has different applications such as for electro-Fenton application, direct oxidation, disinfection, and nanomaterial based cathodes [15, 16, 17, 18]. Torrades and coworkers reported using of Fenton and photo-Fenton for the treatment of textile wastewater . Cruz-González and coworkers used the electro-Fenton method for Acid Yellow 36 decolorization  and Li reported electro-Fenton used for COD reduction of tannery industrials waste water .removal of synthetic dyes waste water by electro-Fenton and photo-electro-Fenton method .also in 2014 reported using of Al and Fe electrode in petrochemical wastewater treatment by electro-Fenton processes . Flores and coworkers reported wastewater removal of olive oil industrials by electro-Fenton and pho electro-Fenton via diamond electrode . Anodic Aluminum Oxide (AAO) was produced via an electrochemical process by anodization of aluminum (Al). Ordered AAO has resistant because of chemical and mechanical properties . Nanopore structures demonstrate a dramatic increase in a surface-to-volume ratio that enhances the signals corresponding to an interaction between analytic and surfaces .All these properties make AAO an excellent candidate with exciting opportunities for development of advanced, smart, simple, cost-effective electrodes for Electrochemical wastewater treating applications. In this work, the removal of chemical oxygen demand (COD) from petrochemical wastewater (PCWW) was experimentally done by using electro-Fenton (EF). It seems using of nano-porosity in the electrode surface can help to improve the act of purification. Due to the very small size of proposition AAO electrode as well as their high active surface it was suggested that also these electrodes use as an auxiliary agent in order to accelerate the production of hydroxyl ions in the reaction medium. All chemicals used here were of reagent grade and used without further purification. Sodium sulfate anhydrous, ferric chloride, sodium borohydride, sulfuric acid, reduced iron powder and other chemical reagents were all of the analytical grades and purchased from Shanghai Chemical Reagents Company. All the solutions were prepared with ultrapure water obtained from a Millipore Milli-Q system with resistivity > 18 MX cm at 25 ᵒC. Their initial pH was adjusted with analytical grade sulfuric acid supplied by Merck. Heptahydrate ferrous sulfate used as a catalyst was of analytical grade purchased from Merck. The AAO films were fabricated using the two-step anodization of 6063 aluminum alloy sheets (1mm thickness). The aluminum sheet was initially cut into 1cm×5cm pieces and degreased in acetone, without further thermal treatment or chemical polishing. The first anodization step was then carried out on the aluminum specimen, suspended in the electrolyte as an anode, under the constant current density of 5mA/cm2 for 10 h. Another aluminum specimen was used as the cathode. Sulfuric acid solution (0.4M concentration) was used as the electrolyte, and the electrolyte temperature was ambient. The formed AAO film was chemically removed by immersing the specimen in 0.4M phosphoric acid solution for 1 h. The second anodization step was subsequently conducted under the same condition mentioned before for the first step, to produce the final AAO film with a regular Nanopore array. Some final samples were immersed in 0.2M phosphoric acid to widen the pores. Finally, the specimens were rinsed several times with deionized water and then dried in the air . Fig. 1showsthat nanopores are formed on aluminumoxide.From the end of anodic alumina pores with hexagonal condensed arrays of nanopores, after unfolding of pores, nanostructures were arrayed under anodizing and produced in the acidic electrolyte at ambient temperature. The size of nanopores between 223.81 nm to 448.76 nm. The electrolysis was performed in a small, open, cylindrical, one-compartment electrochemical reactor of 6-cm diameter and 400 mL capacity, stirred by a magnetic during the treatment to enhance the mass transport towards electrodes. The solution pH was fixed to 3 since much higher pH values hamper the development of Fenton-based systems due to the Fe (OH)3 precipitation, which leads to both the decrease of dissolved iron ion . The solution pH was measured with a Cyber Scan pH 1500 pH-meter from Eutech Instruments. In each run, 250 ml of wastewater was placed in an electrolytic cell and desired amounts of iron (Fe2+) and hydrogen peroxide (H2O2) were added before the electrical current was turned on. Then, AAO electrodes were placed in the reactor and solutions were mixed at 350 rpm . For experiments design, the Design Expert software (RSM Method, version 7) was applied to minimize the number of experiments. The operating conditions ranges were pH of 2-5, the current density of 25-80 mA/cm2, the reaction time of 10-90 min, the H2O2/Fe2+ molar ratio of 0.5-5 and volume fraction of H2O2 to petrochemical wastewater of 0.25-2.14 ml/l. 46 experiments were designed by the software and carried out as illustrated in Table 1. Where A, B, C, D and E are pH, H2O2/Fe2+ molar ratio, volume fraction of H2O2 to petrochemical wastewater (ml/l), reaction time (min) and current density (mA/cm2), respectively. R2 and adjusted R2areclose to one (R2=0.9747 and R2 adj.=0.9544). According to the results, 97.47% of the variations for COD removal were explained by the independent variables in the model. R value is more close to 100%then it proves the high significance of model . The adequacy of developed mathematical models to the experiment was examined by the diagnostic plots such as predicted plot versus actual one (Fig.2) and normal percent probability graphs (Fig.3). The predicted plot versus actual one showed that actual values were distributed near the straight line Fig. 2. It indicates that actual values are very close to the predicted ones. These plots show very good agreement between the observed data and the correlated ones obtained from the models . Fig. 3 shows that reaction time (min) has a positive impact on the progress of the electro-Fenton process. But its effectiveness decreases with increasing time, so after the optimum time, process efficiency does not change with time considerably. That’s why optimal reaction time (min) is obtained at almost 2/3 of the total time . Over time the amount of reactive material in the reaction medium decreases and reduces the pollutant removal rate. To achieve perfect efficiency, the system should be given enough time to be able to produce enough amount of OH ions and take place the act of purification of organic pollutants in the environment. By increasing the time it seems that the system achieves to a chemical equilibrium and the maximum removal occurs at the beginning of this balance and the passage of time do not have much impact on improving the treatment process . Fig. 5 shows the effect of pH on COD removal. As you can see the effect of this parameter within the acidic range is more than basic and to increase to about 2.75, the effect of this factor increases and then began to decline. With increasing pH, the rate of treatment drops sharply. In fact, this is the optimal operating point that away from it, its impact decreases. Obviously, the Fenton reaction occurs at low pH. At Fenton reactions, the highest efficiency obtains when the pH is around 2–4 . Low pH is suitable for the production of hydrogen peroxide because to convert dissolved oxygen into hydrogen peroxide absorb its required proton of the acidic solution . For pH >4 the oxidation rate significantly decreased meanly because ferrous ions are unstable and they easily form ferric ions and precipitate . On the other hand, at very acidic pH, below pH 3, the electrogenerated hydrogen peroxide turns into an oxonium H3O2+ by capturing one proton. H3O2+ is electrophilic, leading to the decreasing rate of reaction between H2O2 and Fe2+ and consequently fewer hydroxyl radicals are produced [36, 37]. ratio with a fixed volume of wastewater increase the amount of H2O2. The increasing leads to an increase in the ratio of and thus increase of the reactive material in the reaction medium. As the figures indicate, increasing of reactive material to the optimal point leads to increasing the amount of COD removal and when passes the optimal point, causing wasting reactant materials. Using these two ratios, the required amount of Fe2+ and H2O2 is obtained. The Fe3+ concentration is a significant parameter in the electro-Fenton process. Fig. 6 represents the influence of molar ratio on the act of purification. Since Fenton’s reaction is of first grade, the growth of the reactants concentration will develop the reaction rate therefore, and concentration of hydrogen peroxide is dependent on the rise of the Fe2+ amount. As can be seen, at low doses, the efficiency ratio is low and this is because the amount of available material is not sufficient for the production of OH and after enhancement, the filtration rate is added till it comes to the optimal point and after passing through this point we see the opposite effect. This negative influence might be due to the increase of the reactions that scavenged hydroxyl radicals, just like Eq. (5). In addition, hydroperoxyl radicals (HO2●), which is a less oxidizing agent than ●OH, would be formed by reaction (6) and(7) as the Fe3+ concentration increased .Another reason for the lower removal efficiencies at high Fe3+ concentration can be the formation of a yellow precipitate of Fe(OH)3, which is deposited on the electrode surface. This deposited Fe3+ cannot be reconverted to Fe2+, so the result is less Fe2+ available to react with the H2O2 to produce hydroxyl radicals . Fig. 7 shows the effect of the volume ratio on the treatment parameter. As can be seen, it has an optimum point. At the small amounts of this ratio, there is no much impact on removal due to the low quantity of hydrogen peroxide in the environment. COD removal can be enhanced by increasing the H2O2 concentration. A further increase from optimum point decreases the removal efficiency. At a high level of H2O2, the decrease in removal efficiency was due to the hydroxyl radical scavenging effect of H2O2 (Eqs. (8) and (9)) and hydroxyl radical recombination (Eq. (10)) [40, 41]. The slope of this graph is greater than the molar ratio graph and by developing a small amount of this ratio we see a significant increase in the amount of treatment. So the hydrogen peroxide has higher efficiency comparing to the iron salts in the experiment environment. Numerical optimization was used to determine the optimum parameters for maximum COD removal. The software automatically gives the optimum conditions. In this software, numerical optimization is used to achieve the maximum amounts of COD removal. In fact, all variables are targeted to be in a range and COD removal are a goal to be maximized. The found data were shown in Table 2. There are very good agreement between experimental optimum data and statistical ones. Table 2 compares our results with the traditional electro-Fenton data (with plain aluminum electrodes) at the optimum conditions, as well . According to this table, modified AAO electrodes increased 11% COD removal. It follows that the creation of Nano surface in a test environment without changes in operating conditions the system can apply appropriate efficiency. Therefore, special attention given to this issue is justified. By comparing the optimal experimental conditions in the presence of Nanoporosity and lack of it, it is observed that time needed to achieve optimal conditions, decreases. In fact, it seems that the presence of Nanoporous in the environment, accelerate the rate of production of hydroxide ions and purification process. But it is evident that in this case the current density increases and the increase may be due to the fact that reactions related to the production of iron ions and disinfectant radicals requires high energy consumption and thus increase the current density and it is because of the reaction time is reduced and treatment is fastened. In the case of pH, it is clear that the operation was carried out in the more acidic range. In the case of the reactive substances which present themselves in the parameters of molar ratio and volume ratio, it is observed that there has been a marked decline and this can be one of the major advantages of using Nanoporous materials, because by creating Nano-porosity can save a significant amount of raw materials is used in the process. This impact is likely to be this way, Nanoporous by creating a higher level, helps to decompose hydrogen peroxide with higher efficiency and thereby reducing the consumption of hydrogen peroxide andiron catalyst. In this study, the electro-Fenton method was proposed to treat effluent from industrial activities conducted in Arak Petrochemical Company. Finally, the operating conditions were optimized and presented to achieve the best results with the highest amount of COD reduction. The optimum COD removal (65.03%) was obtained at pH of 2.96, reaction time of 89.51 min, current density of 69.57 mA, H2O2/Fe2+ molar ratio of 3.42 and volume fraction of H2O2 to Petrochemical wastewater of 1.93 (ml/l) and it can be seen that the modified electro-Fenton process could optimally remove COD from petrochemical wastewater up to 65.03% while it was around 53.94% in the traditional electro-Fenton, as it is observed, treatment using the second method has been improved by 11%.It seems that the Nano-porosity can be used as an auxiliary agent in order to accelerate the decomposition of hydrogen peroxide and ultimately lead to increase in production of hydroxyl ions. Due to the effectiveness of electro-Fenton operation, this method can be proposed as an easy way to petrochemical wastewater treatment. 1. Asatekin A, Mayes AM. Oil Industry Wastewater Treatment with Fouling Resistant Membranes Containing Amphiphilic Comb Copolymers. Environmental Science & Technology. 2009;43(12):4487-92. 2. Tobiszewski M, Tsakovski S, Simeonov V, Namieśnik J. Chlorinated solvents in a petrochemical wastewater treatment plant: An assessment of their removal using self-organising maps. Chemosphere. 2012;87(8):962-8. 3. Pérez G, Fernández-Alba AR, Urtiaga AM, Ortiz I. Electro-oxidation of reverse osmosis concentrates generated in tertiary water treatment. Water Research. 2010;44(9):2763-72. 4. Chen C, Yu J, Yoza BA, Li QX, Wang G. A novel “wastes-treat-wastes” technology: Role and potential of spent fluid catalytic cracking catalyst assisted ozonation of petrochemical wastewater. Journal of Environmental Management. 2015;152:58-65. 5. Jianlong W, Hanchang S, Yi Q. Wastewater treatment in a hybrid biological reactor (HBR): effect of organic loading rates. Process Biochemistry. 2000;36(4):297-303. 6. Guo J, Ma F, Chang C-C, Cui D, Wang L, Yang J, et al. Start-up of a two-stage bioaugmented anoxic–oxic (A/O) biofilm process treating petrochemical wastewater under different DO concentrations. Bioresource Technology. 2009;100(14):3483-8. 7. Yang Q, Xiong P, Ding P, Chu L, Wang J. Treatment of petrochemical wastewater by microaerobic hydrolysis and anoxic/oxic processes and analysis of bacterial diversity. Bioresource Technology. 2015;196:169-75. 8. Lin C-K, Tsai T-Y, Liu J-C, Chen M-C. Enhanced biodegradation of petrochemical wastewater using ozonation and bac advanced treatment system. Water Research. 2001;35(3):699-704. 9. Labiadh L, Oturan MA, Panizza M, Hamadi NB, Ammar S. Complete removal of AHPS synthetic dye from water using new electro-fenton oxidation catalyzed by natural pyrite as heterogeneous catalyst. Journal of Hazardous Materials. 2015;297:34-41. 10. Paramo-Vargas J, Camargo AME, Gutierrez-Granados S, Godinez LA, Peralta-Hernandez JM. Applying electro-Fenton process as an alternative to a slaughterhouse effluent treatment. Journal of Electroanalytical Chemistry. 2015;754:80-6. 11. Gençten M, Özcan A. A detailed investigation on electro-Fenton treatment of propachlor: Mineralization kinetic and degradation intermediates. Chemosphere. 2015;136:167-73. 12. Brillas E, Sirés I, Oturan MA. Electro-Fenton Process and Related Electrochemical Technologies Based on Fenton’s Reaction Chemistry. Chemical Reviews. 2009;109(12):6570-631. 13. Vasconcelos VM, Ponce-de-León C, Nava JL, Lanza MRV. Electrochemical degradation of RB-5 dye by anodic oxidation, electro-Fenton and by combining anodic oxidation–electro-Fenton in a filter-press flow cell. Journal of Electroanalytical Chemistry. 2016;765:179-87. 14. Song S, Wu M, Liu Y, Zhu Q, Tsiakaras P, Wang Y. Efficient and Stable Carbon-coated Nickel Foam Cathodes for the Electro-Fenton Process. Electrochimica Acta. 2015;176:811-8. 15. Petrucci E, Da Pozzo A, Di Palma L. On the ability to electrogenerate hydrogen peroxide and to regenerate ferrous ions of three selected carbon-based cathodes for electro-Fenton processes. Chemical Engineering Journal. 2016;283:750-8. 16. Qiang Z, Chang J-H, Huang C-P. Electrochemical generation of hydrogen peroxide from dissolved oxygen in acidic solutions. Water Research. 2002;36(1):85-94. 17. Pozzo AD, Palma LD, Merli C, Petrucci E. An experimental comparison of a graphite electrode and a gas diffusion electrode for the cathodic production of hydrogen peroxide. Journal of Applied Electrochemistry. 2005;35(4):413-9. 18. Davarnejad R, Azizi J. Alcoholic wastewater treatment using electro-Fenton technique modified by Fe2O3 nanoparticles. Journal of Environmental Chemical Engineering. 2016;4(2):2342-9. 19. Torrades F, García-Montaño J. Using central composite experimental design to optimize the degradation of real dye wastewater by Fenton and photo-Fenton reactions. Dyes and Pigments. 2014;100:184-9. 20. Cruz-González K, Torres-López O, García-León A, Guzmán-Mar JL, Reyes LH, Hernández-Ramírez A, et al. Determination of optimum operating parameters for Acid Yellow 36 decolorization by electro-Fenton process using BDD cathode. Chemical Engineering Journal. 2010;160(1):199-206. 21. Kurt U, Apaydin O, Gonullu MT. Reduction of COD in wastewater from an organized tannery industrial region by Electro-Fenton process. Journal of Hazardous Materials. 2007;143(1–2):33-40. 22. J.M. Peralta-Hernández CAM-H, Guzmán-Mar JL, Hernández-Ramírez aA. Recent advances in the application of electro-Fenton and photo electro- Fenton process for removal of synthetic dyes in wastewater treatment. Journal of Environmental Engineering and Management. 2009;19(5):257-65. 23. Davarnejad R, Mohammadi M, Ismail AF. Petrochemical wastewater treatment by electro-Fenton process using aluminum and iron electrodes: Statistical comparison. 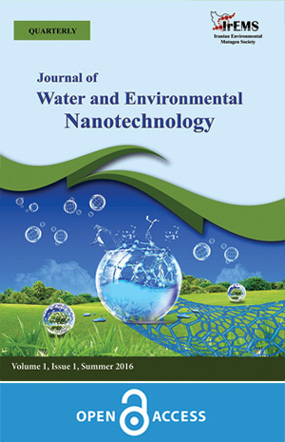 Journal of Water Process Engineering. 2014;3:18-25. 24. Flores N, Sirés I, Garrido JA, Centellas F, Rodríguez RM, Cabot PL, et al. Degradation of trans-ferulic acid in acidic aqueous medium by anodic oxidation, electro-Fenton and photoelectro-Fenton. Journal of Hazardous Materials. 2016;319:3-12. 25. Md Jani AM, Losic D, Voelcker NH. Nanoporous anodic aluminium oxide: Advances in surface engineering and emerging applications. Progress in Materials Science. 2013;58(5):636-704. 26. Santos A, Kumeria T, Losic D. Nanoporous anodic aluminum oxide for chemical sensing and biosensors. TrAC Trends in Analytical Chemistry. 2013;44:25-38. 27. Moghadam H, Samimi A, Behzadmehr A. Effect of Nanoporous Anodic Aluminum Oxide (AAO) Characteristics On Solar Absorptivity. Transport Phenomena in Nano and Micro Scales. 2013;1(2):110-6. 28. Tsantaki E, Velegraki T, Katsaounis A, Mantzavinos D. Anodic oxidation of textile dyehouse effluents on boron-doped diamond electrode. Journal of Hazardous Materials. 2012;207–208:91-6. 29. Davarnejad R, Nikseresht M. Dairy wastewater treatment using an electrochemical method: Experimental and statistical study. Journal of Electroanalytical Chemistry. 2016;775:364-73. 30. Oturan N, Zhou M, Oturan MA. Metomyl Degradation by Electro-Fenton and Electro-Fenton-Like Processes: A Kinetics Study of the Effect of the Nature and Concentration of Some Transition Metal Ions As Catalyst. The Journal of Physical Chemistry A. 2010;114(39):10605-11. 31. Ballesteros Martín MM, Sánchez Pérez JA, Casas López JL, Oller I, Malato Rodríguez S. Degradation of a four-pesticide mixture by combined photo-Fenton and biological oxidation. Water Research. 2009;43(3):653-60. 32. Pera-Titus M, Garcı́a-Molina V, Baños MA, Giménez J, Esplugas S. Degradation of chlorophenols by means of advanced oxidation processes: a general review. Applied Catalysis B: Environmental. 2004;47(4):219-56. 33. Masomboon N, Ratanatamskul C, Lu M-C. Chemical oxidation of 2,6-dimethylaniline by electrochemically generated Fenton's reagent. Journal of Hazardous Materials. 2010;176(1–3):92-8. 34. Rosales E, Pazos M, Longo MA, Sanromán MA. Electro-Fenton decoloration of dyes in a continuous reactor: A promising technology in colored wastewater treatment. Chemical Engineering Journal. 2009;155(1–2):62-7. 35. Jiang C-c, Zhang J-f. Progress and prospect in electro-Fenton process for wastewater treatment. Journal of Zhejiang University-SCIENCE A. 2007;8(7):1118-25. 36. Panizza M, Barbucci A, Delucchi M, Carpanese MP, Giuliano A, Cataldo-Hernández M, et al. Electro-Fenton degradation of anionic surfactants. Separation and Purification Technology. 2013;118:394-8. 37. Umar M, Aziz HA, Yusoff MS. Trends in the use of Fenton, electro-Fenton and photo-Fenton for the treatment of landfill leachate. Waste Management. 2010;30(11):2113-21. 38. Lin H, Zhang H, Wang X, Wang L, Wu J. Electro-Fenton removal of Orange II in a divided cell: Reaction mechanism, degradation pathway and toxicity evolution. Separation and Purification Technology. 2014;122:533-40. 39. Pajootan E, Arami M, Rahimdokht M. Discoloration of wastewater in a continuous electro-Fenton process using modified graphite electrode with multi-walled carbon nanotubes/surfactant. Separation and Purification Technology. 2014;130:34-44. 40. Rosales E, Pazos M, Sanromán MA. Advances in the Electro-Fenton Process for Remediation of Recalcitrant Organic Compounds. Chemical Engineering & Technology. 2012;35(4):609-17. 41. Muruganandham M, Swaminathan M. Decolourisation of Reactive Orange 4 by Fenton and photo-Fenton oxidation technology. Dyes and Pigments. 2004;63(3):315-21.